Brick wall construction for house building. The house construction from blocks and bricks. Stack of concrete blocks. 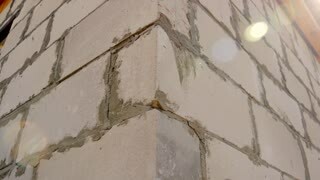 Professional masonry builder work. 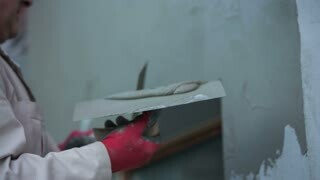 Close up footage of man in protective light color clothes working around a house wall polishing fresh cement. Removing excess cement from wall close up. Professional masonry man working on a new house outside wall with adding coat of rough cement with masonry tools. Man mason new house wide shot. Professional masonry man working on a new house outside wall with adding coat of rough cement with masonry tools. 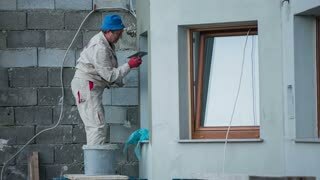 Putting a coat of cement on wall. Professional masonry working on a new house outside wall with adding coat of rough cement with masonry tools. Bucket of cement. 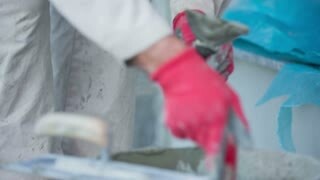 Person in protective clothes add cement on square-trowel in close up. Focused masonry builder working on a wall. Professional masonry man working on a new house outside wall with adding coat of rough cement with masonry tools. Hands of the Builder Put a Cement Mortar. Hand Makes the Masonry of Brick. Moscow. Russia. 2018. Laying Paving Slabs by mosaic . Road Paving, construction. Repairing sidewalk. Worker laying stone paving slab. Laying tiles in a city park. Unusual wall made of vintage red brick in modern loft. The camera moves from left to right. Concept of creative construction works. Slow motion. Slow motion handheld closeup pan of filled seams on brick wall.